bitter sweet stamping: It's a boy! My husband's best friend from high school had a baby last week - his third, and it's a boy ... George the Fourth!! George the Third is the youngest of 7!!! - his dad wasn't stopping until he got a boy, and George felt much the same with his 2 girls! We are so happy for them and their new little boy!! As we say around here - "Yeah, boy parts!!" 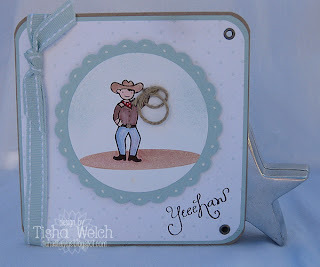 I made this card for them because it is so awesome that they have a boy, and they live in Texas! I forgot to take a pic of the inside, but I altered the A Muse "bundle of joy" stamp by omitting the "j" of joy and hand lettered a "b" so it says "bundle of boy"!! Don't worry, I won't break my arm patting myself on the back - I'm sure I have seen others do that before!! Details: Stamps by A Muse, CS by A Muse and SU!, ribbon & hemp twine by SU!, punches by Marvy, eyelets by Making Memories.